We are a welding company that is family owned and operated. We are licensed, certified, and insured. Offering both shop fabrication as well as mobile welding services. We serve the Northern Virginia area. 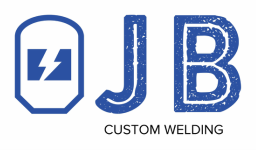 Why do business with JB Custom Welding? Professional and Honest: Don't take our word for it just look at our reviews on Google. Pass a background check: See our profile on Thumbtack where they did a criminal back ground check on us and Castle Branch did a background check on us. We have done onsite welding work in government classified locations for DOD and US intelligence agencies. We have welded on various projects at various defense contractors in Northern Virginia as well. Certified: We are certified to weld in multiple processes and are happy to provide paperwork to prove it. Insured: You may be surprised to find out its not easy to have insurance as a welder and for good reason. Welding can be dangerous. Every time you start a weld you are creating a fire (something insurance companies typically don't like). We have both liability and workers comp insurance. Highly Trained: Jordan has trained at a local vocational school for welding as well as taken college courses in welding. Customer Service: We are interested in long term relationships with our clients. For business relationships to last they have to be win-win. We want our customers to win and we do that by providing the best quality welding in the area. We look after our clients best interest even if it means we don't do any work for them. We love working with metal to repair old things and create new things. We see to it that repairs are done quickly and projects are built to last. Whether its fabricating a custom design, building the best firepits, or doing a simple welding repair on your wrought iron chair, hand rails, or a steel fence we can help. We work close with all our customers to make sure they get the best value they can with each individual project. Projects can be brought to us or we can do onsite welding at your place. In addition to our normal business hours, we are available 24 hours a day, seven days a week for any emergency welding services needed (emergency rates apply). If you are looking for quality welding for miscellaneous metals such as steel, stainless steel, or aluminum in the Sterling, Chantilly, Herndon, Dulles, Ashburn, Manassas, South Riding, or anywhere in Loudoun, Fairfax, or PWC counties give us a call. Looking for a welder in Loudoun county that can respond right away? Give us a call. Our welding shop is close to Fairfax county and Dulles airport. We can come to your location to do repairs or you can bring it to our welding shop in South Riding. Looking for our YouTube videos​?